In your face too much? Remember, you can catch live, near real-time coverage of SEC Media Days right here beginning tomorrow night. We’ve teamed up with BAMS Radio, who will have a credentialed correspondent on the scene for the big event. News will be fed directly to the blog, and the blog software will tweet the updates as they come in. Listen to BAMS Radio every Wednesday night 8PM CST. 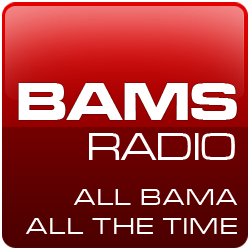 BAMS is a growing Blog Talk Radio show that has already had such notable guests as former Alabama assistant coach Joe Kines, former Tide great Siran Stacy, Crimson Tide Sports Network’s Eli Gold, even your beloved Blogger-in-Chief! Follow on Twitter and Facebook and follow BAMS Radio here.